MRM started out supplying nutritional supplements exclusively to doctors. Today, you don’t need a prescription to benefit from founder Mark Olson’s dedication to hard science! A great rush is underway in the supplement industry to turn a profit, but the best see through the hype and do things the right way. Metabolic Response Modifiers (MRM) has worked long and hard to become a name customers can trust. Founder and CEO Mark Olson got his start advising other supplement companies, but it didn't take him long to see how his skills could transfer to his own venture. He created MRM in 1996, and in this interview, he let us in on how he continues to push it toward excellence. Congratulations to Olson and MRM, Bodybuilding.com's supplement company of the month! In 1996, after doing graduate work in clinical nutrition at UCLA, I began doing nutritional consulting for companies such as EAS and others. It was at that time that I decided to start Chemi-Source, Inc. with a loan from my father. It was a means to find a home for what I called my "novel neutraceuticals intermediates." These were nutritional ingredients which I procured and modified for market as new-to-the-industry raw materials. Those included creatine monohydrate, melatonin, DHEA, MSM, lipoic acid isomers, structured lipids, pregnenolone, and the caffeine-ephedrine combo. Chemi-Source was a double-edged sword. These raw materials eventually became widely used and became the backbone of the industry. When people initially encountered them they didn't necessarily know how to use them or market them. That is what prompted me to start Metabolic Response Modifiers, a physician-only supplement line that featured the finest materials from worldwide biological material producers. Two years later, I stopped all consulting for sports nutrition companies and began to develop my own sports nutrition line for the mainstream. I saw the kind of money my formulations were making my clients and thought I could do the same for myself by developing other natural materials I had discovered into highly-effective therapeutic nutritional products. At the same time, my father had been fighting cancer—for nine years at that point—so much of the focus of my time was devoted to developing formulas that could counteract the undesirable effects of his oncological medications and cachexia (weight loss and weakness). LiverX is one of those products, but there are others. I also developed formulas for my mother, a former pro ice skater who still believes she is a professional athlete. I supplied her with Joint Synergy to counteract the aches and pains of athletic overuse and aging. Along the way, I also knew the profits I made would fund my dreams of collaborating with other researchers on my own clinical investigations. As a dyed-in-the-wool scientist by trade and education, I wanted my work to appear in peer-reviewed journals. This is always the seal of approval I seek in order to validate the effectiveness of my formulations. Who were some of the people who helped you in the beginning? My father is number one. He was always a great role model for me. He gave me the ability to see beyond my circumstances and to think long-term, by way of a 50,000-foot view of life and what's important. He was full of old quips that I find myself repeating today, such as "Leave it better than you found it," "Be a giver, not a taker," and "Do what you were intended to do, and everything else will follow." In graduate school, I also had a friend named Geffen who was good at exposing me to life, challenging me, and enlightening me. Early on, it was a guy by the name of Anthony Almada—a high school swim and surf buddy—who ended up hiring me for my first industry position as a biomedical research consultant. I owe him my first paycheck. His nutritional philosophies and academic rigor pushed me further than I could have gone on my own. Tell us a little more about yourself and your background. I grew up a typical So-Cal beach kid, spending more hours in the water than on land most days. I was not academically inclined throughout high school. I was more like the archetypal Jeff Spicoli character in Fast Times at Ridgemont High than an academic. It wasn't until I went back to college that I found my inspiration and calling in the field of nutrition. The science classes nearly killed me, but I stuck with it, and the next thing I knew I was president of the Student Dietetic Association at Cal State University, Long Beach, and being offered a job at the Harbor-UCLA research facility. I was working at the National Institute of Health-funded Clinical Studies Center when Anthony hired me as a consultant. From there, my baptism into the industry was a veritable whirlpool. On the second day of my consulting I took part in a meeting with Dr. Pierre Bracade (acknowledged as the godfather of pycnogenol research). In my second week I was asked to be part of a steering committee for what is now the Natural Products Association. It was while serving on that committee that I developed, or refined, many "industry-first" ingredients, including melatonin, and lipoic acid isomers, to name a few. I also participated in document submissions and support for the development of the Dietary Supplement Health and Education Act of 1994. Now 16 years in, what separates your company from others in the industry? We are about science from the top down. Because of our scientific knowledge, we tend to hold ourselves to higher standards. Unlike companies that don't staff a research and development team and have no clue about the science of supplements, we aren't fooled by flash-bang faulty data. We also aren't particularly keen on following trends just to find a quick audience. Companies without science behind them are largely "flavor of the month" followers who mimic others or use gimmicky ingredients (fizzy/buffered creatine, ethyl-ester forms, liquid forms) to attract buyers. I think consumers are becoming much savvier to this sort of thing, largely as a result of sites and forums like Bodybuilding.com. Your customers and readers clearly have a desire to learn. They need to know that we read the journals so they don't have to. Because of that, we know what's been shunned by the scientific community as inferior in value and benefit. 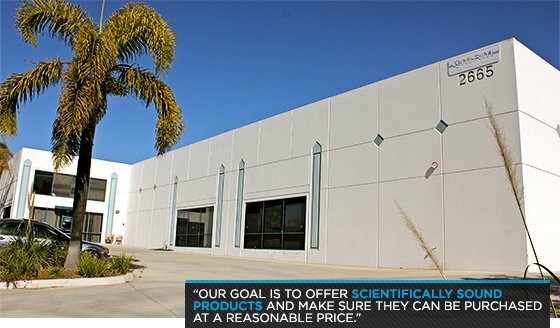 Bottom line: Our goal is to offer scientifically sound products and make sure they can be purchased at a reasonable price. We continue to offer good prices for good products because we spend our money on human clinical trials and analytical testing, and not on advertising. If that has delayed universal recognition, so be it. Slow and steady wins the race, and we've been difference. MRM's All-Natural Whey protein, Digest-ALL and Relax-ALL, while not my most sophisticated formulaic creations, are certainly some of the most effective and reasonably priced in the industry. 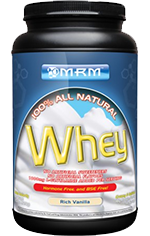 Find MRM All-Natural Whey Protein on our store. Are you coming out with any new products in the near future? Yes, we are. I can't be more specific, but we are always looking to offer effective formulas in "natural form." This has become a big thrust of the company going forward into the next decade. People hear "natural" and think "ineffective," because it's difficult to create an effective natural product using only natural-form nutrients, sweeteners and flavors. Few people can do it and keep it cost-effective. It requires a lot more effort and creativity to compete with artificially-enhanced formulas. I think this is where MRM excels and will continue to excel with each passing year. Do you have any sponsored athletes? If so, how do they enhance your company, and the industry at large? Yes, we do. We feel that every athlete we take on must be a true representation of our company. We sponsor professional and amateur athletes, from those involved in extreme sports and fitness, to endurance athletes, and even folks involved in the Wounded Warrior Project. They're men and women, young and old—much like the MRM HQ Crew. To learn more you can visit: www.mrm-usa.com/athletes. Let's say a customer is just starting a fitness regimen and came to you saying they could only afford a couple of products. Which supplements would you recommend and why? That's a tough question. Because I'm a dietician, I admit it's hard to say without knowing a person, their daily diet and goals. But in the end, I would recommend fish oil like our FreshOMEGA, a good multi-vitamin like our Beyond Basics, and a protein supplement like MRM's All-Natural Whey. Other than that, I'd recommend adding more vegetables and small amounts of fruit to their diet to replace those starchy, glutinous carbs. What are the best and worst things about the contemporary supplement industry? The worst parts of the supplement industry are the people or brands in our industry that make claims based on weak science, or no science at all. It frustrates me, because I cannot make such claims, either by conscience or law. But because of the absence of wild claims, people sometimes assume that our product somehow doesn't stack up to those other products. All I ever hope for is a level playing field. Conversely, the best part of this industry is when I receive calls and letters from customers who are back doing what they love doing because our supplements have helped them get there. Hearing that someone is living a better quality of life, has changed their body composition, or is somehow living better as a result of my supplements makes me proud. It also makes my mom proud of me, and that's always a bonus. I don't think they are as important as they once were. We have entered an age where we can reach so many more people by way of our presence on the web and through social media. We love to go to shows to meet our customers and find out what's important to them, but for growth, web-based marketing allows a broader reach and is more cost-effective than most print advertising or attendance at shows. We still do a select amount per year, but that has diminished over the years. The supplement world is growing across the globe. How do you reach new markets? Prior to 2002, we opened offices in key countries to establish ourselves in that region—in the United Kingdom, Canada, and Australia. It helped with foreign registration issues and kept us abreast of culture-specific marketing. These days, the web takes you everywhere and enables more cost-effective business with less required travel. I have kids to raise and support, you know! Now most of my travel is done on personal trips with family. Ethics are important to supplements buyers. What does your company do to ensure ethical standards? We are who we are, and we're happy for anyone to know it. Obviously we can't disclose proprietary formulation and educate our competitors on how we create our formulas, but we do try our best to disclose as much as we can on our labels. Transparency goes a long way. Our goals for 2013 include sustainability, traceability, and ongoing transparency. To that end, we have enrolled many of our products for certification by the Non-GMO Project. Our Veggie Protein gained that certification in 2012, and others are slated to follow this year. Our extra-virgin salmon oil FreshOMEGA™ was approved this year by "Friend of the Sea" for its sustainability. These certifications exemplify our efforts for high quality and mutually beneficial trade practices. My father told me to always "leave it better than you found it." I define that as doing "full-circle business." My dad would have been proud of what MRM has become. Our focus on quality of life is all-encompassing, and even our corporate culture is centered on that. Our employee retention rate is reflective of that. Fifty percent of employees hired eight years ago are still with us today. I deeply care about everyone here. The happier my employees are, the easier my life is, and the more successful my company will be. Does MRM perform its own research? How much will science guide your future? That's easy. The short and long answer is yes, we conduct our own research. 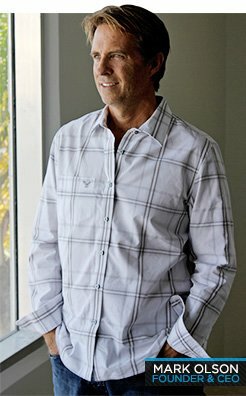 Since leaving the Clinical Studies Center at Harbor-UCLA, I have had the pleasure of collaborating with world-renowned researchers at prestigious universities across the globe. We conduct mostly human clinical trials that directly measure end-points of performance or desired metabolic modifications. Scientific data is the basis of our product development guide. As the industry matures, future regulations for supplements (FDA or FTC) will demand appropriate data for each claim made. In our estimation, that will be a good day. Before we wrap this up, is there anything else you would like to share? Once again, it's important to relay that no one should believe everything they read. It's okay to ask for the data! We like to put our money where our mouth is. We put more money into sampling so customers can "try before buying." I am excited about the future of MRM, and want to thank our loyal MRM customers for allowing us do what we are passionate about. How long have you been sponsored/involved with MRM? What made you join the team? I will have officially been with MRM for one year on the eve of the Arnold Sports Festival, but I have been carrying its products in my gym for years. I emailed them a few weeks before the Arnold in 2012 and the next thing I knew, I was being flown out to Ohio for an experience I will never forget. I couldn't be more grateful. The main reasons why I wanted to get involved with MRM, is that they are local for me, and they aren't an overly-marketed company that relies on flashy gimmicks and fads. 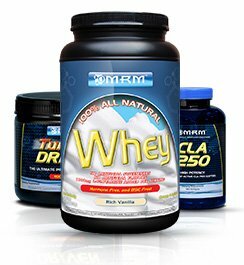 All MRM products are thoroughly researched and created to deliver what they promise. I can't support something I don't believe in, so actually liking their products was key for me. Do you think it's important for athletes to earn sponsorships? Why? I think that the networking aspect of sponsorship is the most important. You have to remember that there is life off of the stage. Any smart athlete knows that the stage is an ego stroke, but it doesn't mean anything if you don't do business off stage. No matter what your sponsorship entails—whether it's just product or it is pay—networking to build relationships is crucial to your success in a field that is becoming overrun with great bodies. Being sponsored by a company with whom you are proud to align your name is also important. You must be passionate about the brand, and have faith in its team. How has being sponsored by MRM helped your career in the industry? MRM had faith in me from the start and picked me up before my first competition—before anyone knew my name. That confidence in me has driven me to surpass limits this year. A year ago, I was working away doing my own thing, but with the help of MRM I have been catapulted into the industry head-first. MRM has given me a lot of exposure which would have taken me years to achieve on my own, and for that I'm extremely grateful. This industry is a business, not a series of isolated competitions. If a competitor fails to network off the stage, they probably won't make a career out of fitness. For me, fitness is a lifestyle, and if I continue to be blessed, it will also be a career. But health and fitness are the backbone of good living. Relationships with amazing people like Mark Olson, and the MRM team, are a bonus. When training, what is your favorite MRM supplement? How do you use it? It is no secret to anyone following me on Facebook or Twitter that I absolutely adore the MRM Reload. I attribute a lot of my lean muscle retention to supplementing every day, every workout, and every competition with this product. Reload has key branched chain amino acids, L-leucine, L-valine, L-isoleucine, plus L-glutamine and Beta-Alanine for better absorption and more enduring workouts. Without going into a science lesson, it reloads the body with BCAAs used during exercise and aids muscle retention like no other product I know. In my regimen, I take three scoops during my workout for endurance, energy, rapid recovery, and hydration. It boosts my drive without loading me down with caffeine or other stimulants, and it tastes great. The supplement industry is rife with ineffective products. How do you know MRM's products work? This kind of takes me back as to why I chose MRM. If you notice they always bring a research and development person to every big expo. That's because they want transparency and for people to know that they aren't just filling up a jar with junk. You don't hear about them as much, so people assume they aren't as strong as brands that are constantly in your face, but they prefer to put their pennies into the science of a product. In my experience, taking numerous MRM products, each one has a purpose—and being trendy is never part of that. Everything you buy from MRM has been thoroughly researched and they have the paper to prove it. How has your performance in the gym improved using MRM's supplements? I didn't routinely ever take pre-workout supplements, but Turbo Driven has helped fuel my workouts in ways I never imagined possible. It gives me the extra energy to continue to push hard through difficult workouts. And like I said earlier, Reload has helped so much with muscle recovery. It's noticeable. I take it religiously. Is there anything else you care to share about MRM? Any good 'inside' stories you'd like to tell? Ha! A lady never tells. I may have to get back to you on something like that in the future. What I will say is, MRM is a tightly knit team, and it's been an adventure so far. I can't wait to see what 2013 has in store for us all! I keep my weight light for the first set, moderate for the second set, heavy for the third set, and moderate for the last set.